Freeview app brings live and on-demand TV to your iPhone | What Hi-Fi? Here's an easy way to get free access to live and on-demand shows from BBC, ITV and Channel 4 on your phone: the new Freeview app. Launching today on iOS, and promised for later this year on Android, the Freeview app lets you stream live TV shows on BBC, ITV and Channel 4, as well as accessing on-demand content from BBC iPlayer, ITV Hub, All 4, My5, and UKTV Play. The app, like Freeview itself, is of course free (the clue's in the name), though you will still need a TV license (as is the case if you watch iPlayer or any other live or recorded TV shows). 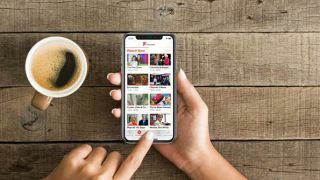 The Freeview app promises thousands of hours of content, with a searchable TV guide and programme recommendations, should you need some inspiration on your daily commute. While the iPlayer app and other TV apps have already delivered content live and on-demand to your iPhone or iPad, this looks like a neat way of bringing it all together in one place. Available on all Apple devices with iOS 11 or above, we look forward to taking it for a spin.